The submersible Alvin, with a pilot and two scientific observers inside, is ready to be deployed in the Pacific Ocean. 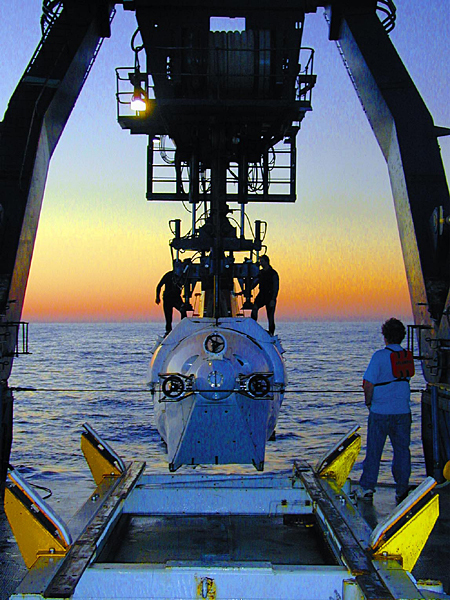 The sub is owned by the U.S. Navy and operated by the Woods Hole Oceanographic Institution. 9:12 a.m., Dec. 3, 2004--Tens of thousands of students from around the world will join University of Delaware College of Marine Studies researchers as they undertake a scientific expedition to hydrothermal vent sites nearly two miles below the surface on the Pacific Ocean floor. The expedition, Extreme 2004: Exploring the Deep Frontier, and a concurrent virtual voyage for middle and high school students, is being held from Nov. 30 to Dec. 20 under the leadership of Craig Cary, a UD associate professor of marine biology and biochemistry and director of the Center for Marine Genomics. UD researchers will be aboard the research vessel Atlantis and will make use of the submersible explorer Alvin to study hydrothermal vent sites and the unusual creatures that inhabit them, including the Pompeii worm, the vent crab and various bacteria. These creatures live at the extreme, with very high temperatures close to the vents and very low temperatures in the seawater surrounding them. Specifically, he said the scientists will study the bacteria that live on the worms and how these bacteria respond to the harsh environment. More than 53,000 middle and high school students from seven foreign countries and more than 760 schools in 49 states, the District of Columbia, Puerto Rico and Guam will participate in the dive by using Internet and telephone connections, according to Tracey Bryant, director of the UD Marine Public Education Office. Countries represented this year include Canada, Iran, Mexico, New Zealand, the United Kingdom and Uzbekistan. Additionally, Bryant said a companion program is being hosted in Austria this year, using UD resource materials translated into German. Students will be able to follow the expedition on a UD-maintained web site and communicate with the researchers via e-mail and telephone calls placed directly to Alvin as it makes its way deep into the Pacific. The web site can be found at [www.ocean.udel.edu/extreme2004]. Participating teachers and students have been provided a printed curriculum, a video documentary and evaluation materials, Bryant said, and classes from 48 schools will be provided an opportunity to place a call to the Alvin. Cary added that having an international audience is also a bit scary because our intent is to not only show them all of our successes but our failures as well. That is what science is all about, what makes it challenging and yet so rewarding. Two years ago, he said, the expedition lost a key piece of equipment on the ocean floor. Cary said he hopes the students who are involved gain an appreciation for what science is all about and that it is a multifaceted discipline that brings together all types of people and fields to work toward solving common questions of interest. 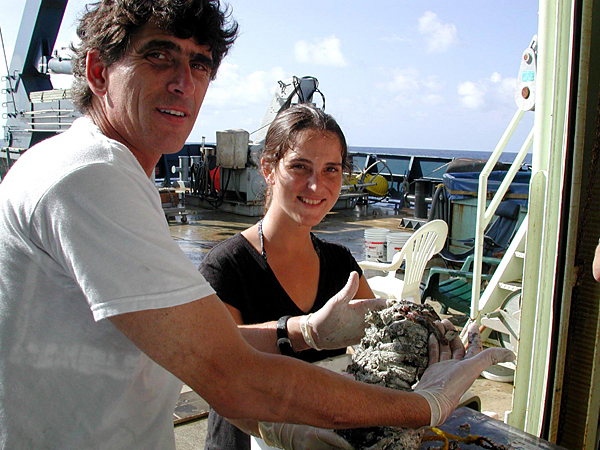 Researchers Craig Cary from the University of Delaware and Julie Robidart from Scripps Institution of Oceanography examine a portion of a hydrothermal vent chimney collected from the Pacific Ocean floor at a depth of nearly 2 miles. The 2001 expedition marked the first time DNA sequencing had been accomplished at sea, and, during the 2002 expedition, a middle school teacher joined scientists and crew aboard the Alvin to explore the ocean depths. In 2003, a number of new scientific sampling instruments and methods were tested, which will be used in this years major genomics study of the Pompeii worm. 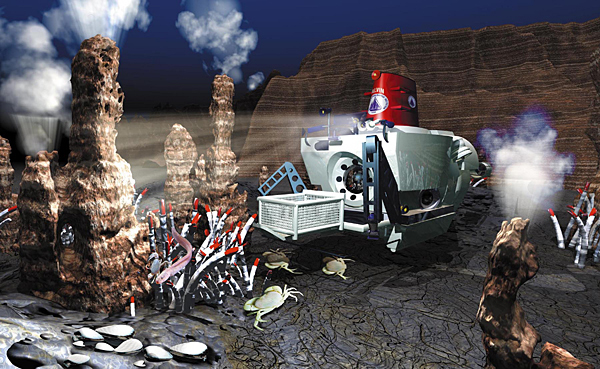 Extreme 2004: Exploring the Deep Frontier is sponsored by the University of Delaware College of Marine Studies with primary funding from the National Science Foundation. Additional support has been provided by the National Oceanic and Atmospheric Administrations National Sea Grant College Program and WHYY-TV, the Public Broadcasting System affiliate serving Wilmington and Philadelphia, and the University of Waikato in New Zealand. In addition to the University of Waikato, other institutions participating in the 2004 expedition are the Desert Research Institute, Harvard University, Scripps Institution of Oceanography, the University of Greifswald in Germany, the University of Vienna, the University of Oregon and the University of Southern California. Previous University of Delaware research confirmed that the Pompeii worm is the most heat-tolerant animal on Earth, able to survive an environment nearly hot enough to boil water. 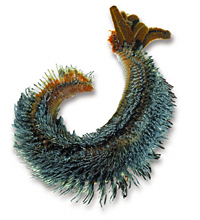 Covering this deep-sea worm's back is a fleece of bacteria. These microbes may possess heat-stable enzymes useful in a variety of applications, such as pharmaceutical production, food processing, paper and textile manufacture, and others. In addition to Cary, UD research team members include Shellie Bench, a doctoral student; Barbara Campbell, a research scientist; Mihailo Kaplarevic, a doctoral candidate; Michael League, a masters student; Kevin Portune, a masters student; and Shannon Williamson, a postdoctoral fellow. They represent the College of Marine Studies, the Department of Plant and Soil Sciences in the College of Agriculture and Natural Resources and the Department of Electrical and Computer Engineering in the College of Engineering. The shipboard education coordinators will be League and Karen Romano Young, a writer, illustrator and educator.